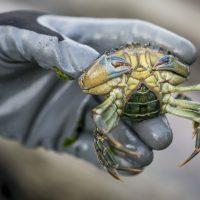 Emily Grason and Crab Team volunteers are on a mission to protect the Salish Sea from one of the world’s worst invasive species. Emily Grason can’t help but respect invasive European green crabs that are arriving on Washington state’s interior coasts. “They’re charismatic,” says Grason, aquatic invasive species specialist at Washington Sea Grant, part of the College of the Environment. 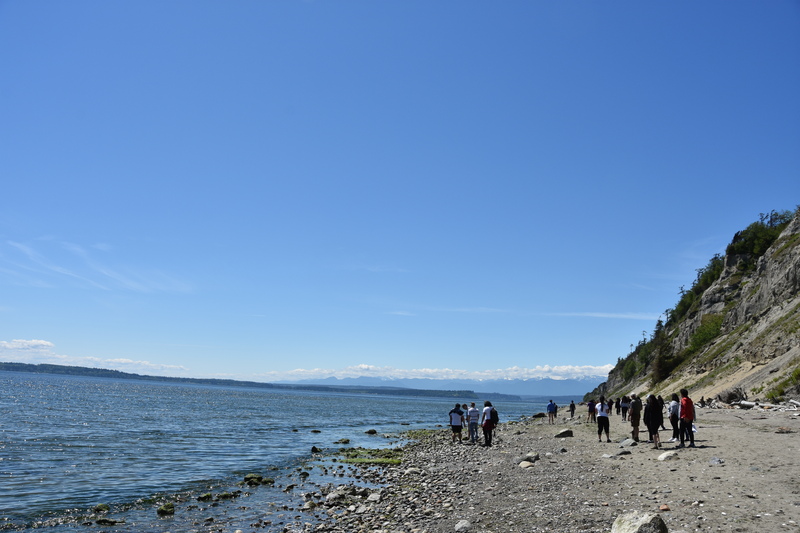 Students in ESS 101 walking north along Double Bluff Beach on Whidbey Island, examining geologic features as they go. On a clear, windy Saturday morning, a convoy of University of Washington vans weaves through Seattle’s streets and north toward Mukilteo. They load onto a ferry named Tokitae and head west. Students in Professor Terry Swanson’s Introduction to Geology & Societal Impacts (ESS 101) class are headed to Whidbey Island—Washington state’s largest island and the landmass that forms the northern border of Puget Sound’s waters. This is Professor Swanson’s favorite field excursion of the quarter, because he’s a glacial geologist and Whidbey was formed by glaciers millions of years ago. Sojourning to Whidbey, one of 10+ field trips offered as part of Earth and Space Sciences‘ ESS 101, gives students an opportunity to explore one of Washington’s most geologically rich field sites up close—complete with glacial erratics, eroding bluffs and layers of sediments and terrestrial deposits. 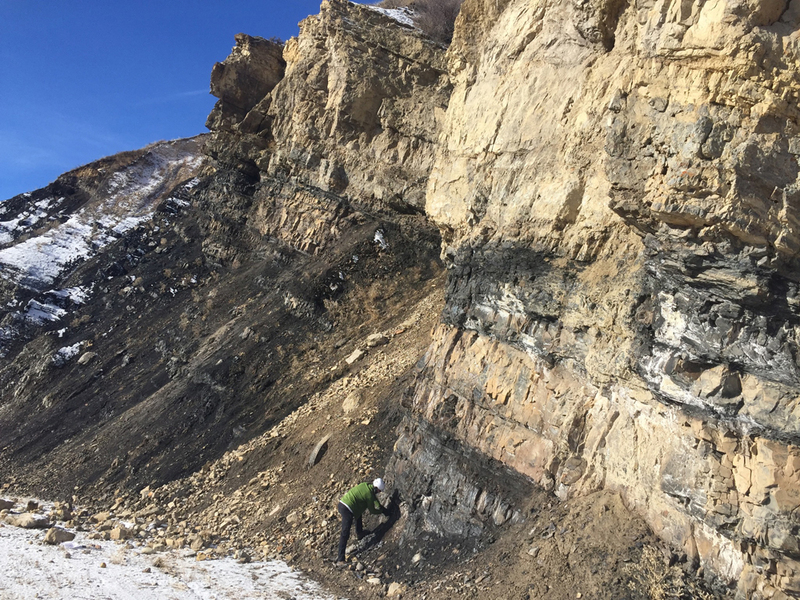 See what it’s like to be a student in Professor Swanson’s Introduction to Geology & Societal Impacts class, which is offered every quarter, and consider whether this immersive course might be a fit for you. Anthony Dichiara, a University of Washington professor in the School of Environmental and Forest Sciences, holds a piece of “smart” paper created in his lab. In cities and large-scale manufacturing plants, a water leak in a complicated network of pipes can take tremendous time and effort to detect. Nearly a quarter-million water line breaks occur each year in the U.S., which costs public water utilities about $2.8 billion annually, according to the American Water Works Association. 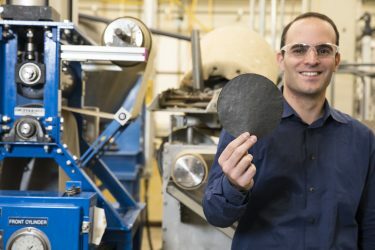 A University of Washington team wants to simplify the process for discovering detrimental leaks by developing “smart” paper that can sense the presence of water. The paper, laced with conductive nanomaterials, can be employed as a switch, turning on or off an LED light or an alarm system indicating the absence or presence of water. The researchers described their discovery in a paper appearing in the November issue of the Journal of Materials Chemistry A. 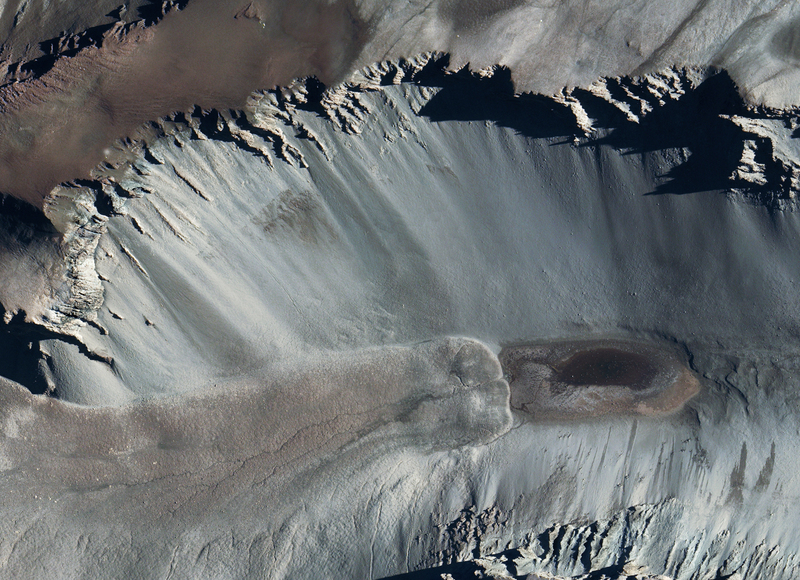 A satellite picture shows Don Juan Pond and surrounding slopes. Understanding the hydrology of this cold, dry environment could help explain conditions on Mars. At the base of the Transantarctic Mountains lies a geological oddity. Don Juan Pond is one of the saltiest bodies of water on the planet, filled with a dense, syrupy brine rich in calcium chloride that can remain liquid to minus 50 degrees Celsius, far below the freezing point of water. But the source of water and salt to this unusual pond remains a mystery — even as hints emerge that water in a similar form could exist on Mars. A new University of Washington study uses the pond’s bizarre chemistry to pinpoint the water’s source. The recent paper, published Sept. 15 in Earth and Planetary Science Letters, reports that it is fed by a regional deep groundwater system and not, as previously suggested, from moisture seeping down from local valley slopes. “Don Juan Pond is probably one of the most interesting ponds on Earth,” said lead author Jonathan Toner, a UW research assistant professor in Earth and space sciences. “After 60 years of extensive study, we still don’t really know exactly where it’s coming from, what drives the fact that it’s visible on the surface, and how it’s changing. Read more about this work and what it means at UW Today, Newsweek, Scientific American and The Daily Mail. It’s no secret that human activities affect fish, particularly those that must migrate to reproduce. 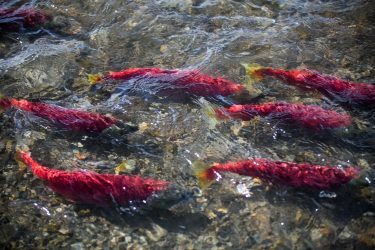 Years of building dams and polluting rivers in some regions have left fish such as salmon struggling to return to their home streams and give birth to the next generation. A new University of Washington study points to yet another human factor that hampers the ability of fish to reproduce: the timing of our fishing seasons. The paper, appearing online last month in the journal Fish and Fisheries, is one of only a handful of studies that considers how the timing of fishing efforts might disproportionately target certain fish and change the life history patterns of entire populations. The authors, Michael Tillotson, UW doctoral student in aquatic and fishery sciences, and Tom Quinn, UW professor of aquatic and fishery sciences, build the case for more attention on timing by outlining examples of how fishing seasons have altered a population’s makeup — specifically, its diversity and productivity. The study was funded by a fellowship from the UW’s IGERT Program on Ocean Change and the ARCS Foundation. Researchers recover a trap after it landed on the bottom of the Mariana Trench. Meet the deepest fish in the ocean, a new species named the Mariana snailfish by an international team of researchers that discovered it. They’re small, translucent, bereft of scales — and highly adept at living where few other organisms can. The Mariana snailfish (Pseudoliparis swirei) thrives at depths of up to about 8,000 meters (26,200 feet) along the Mariana Trench near Guam. The team published a paper describing the new species this week in the journal Zootaxa. Snailfish are found at many different depths in marine waters around the world, including off the coast of San Juan Island, where Gerringer is continuing research on the family of fish. This new species appears to dominate parts of the Mariana Trench, the deepest stretch of ocean in the world that is located in the western Pacific Ocean. As Earth’s oxygen levels rose to near-modern levels over the last 800 million years, phosphorus levels also increased, according to modeling led by the UW’s Michael Kipp and others. Accordingly, Kipp said, large phosphate deposits show up in abundance in the rock record at about this time. This is a Wyoming portion of The Phosphoria Formation, a deposit that stretches across several states in the western United States and is the largest source of phosphorus fertilizer in the country. 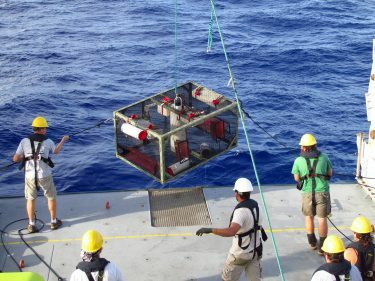 The amount of biomass — life — in Earth’s ancient oceans may have been limited due to low recycling of the key nutrient phosphorus, according to new research by the University of Washington and the University of St. Andrews in Scotland. The research, published online Nov. 22 in the journal Science Advances, also comments on the role of volcanism in supporting Earth’s early biosphere — and may even apply to the search for life on other worlds. The paper’s lead author is Michael Kipp, a UW doctoral student in Earth and space sciences; coauthor is Eva Stüeken, a research fellow at the University of St. Andrews and former UW postdoctoral researcher. Roger Buick, UW professor of Earth and space sciences, advised the researchers.